An outline view shows the hierarchical structure of the entire document as an outline. Containers - notes containing other notes - can be expanded or collapsed to show child notes (and there are shortcuts to assist with this). An outline is useful for seeing many notes in one window. It is easy to restructure the hierarchy of the document in an outline window, by dragging parts of the hierarchy to other parts of the hierarchy. It is generally the most useful view to use when laying out notes for export. An outline view does not show any of the links in the document. Note titles can be edited in situ. There is also a preference to turn this feature off. Long titles will wrap to a second line. The size of the note, with 0-4 lines inside it, indicates the amount of text in the note. The inside of the note yellows over time giving some indication of older notes that have not been edited for some time. Zooming only effects the vertical axis, with the windows user-defined width being retained. Notes and agents are shown in outlines, with any aliases (such as inside agent containers) being in italic script. Notes have a thicker bar at the top of their icon, whilst agents have a thinker bar at the bottom. The note/agent and its title take the color of the objects' $Color attribute. To help with legibility, there is also a 'Darker colors' option in The Outlines tab in Document Settings that - as it implies - slightly darkens the colours used in the Outline view from their defined $Color value. 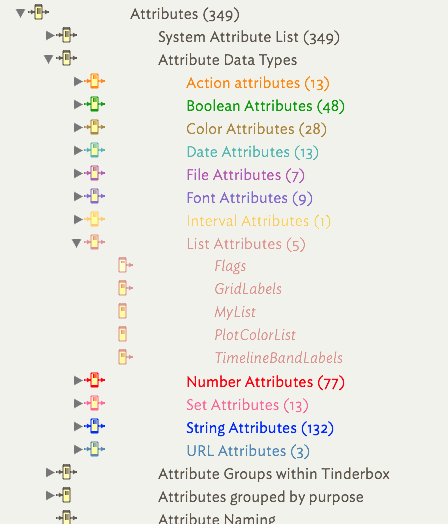 Separators add the ability to delimit sets of sibling notes and are not drawn in Map and Chart views. Outline view can be enhanced by the optional display of item checkboxes and column display of attribute data.